The "bean" - To grrr, or not to grrr? That is the question. The "bean", originally uploaded by joemorris. It's the bean at AT&T Plaza in downtown Chicago. Hello! I've never seen a bean picture where there was no one else in it! I guess there is one guy all the way in the back. But that's impressive. I was just on one side, but in general it was pretty deserted. It was still cold outside and not many tourists this time of year. looks like you're having a great trip. Thanks for letting us "come along". The high quality photos will be posted tonight or tomorrow morning hopefully. This was just with my phone. I just realized you don't see too much of the actual "bean" here in this shot. 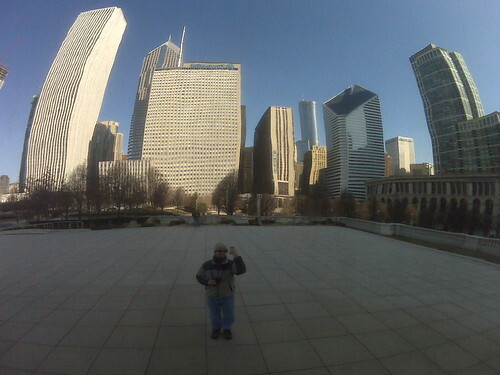 A small lesson in common local speak, Chicagoans refer to it as "the Bean in Millennium Park." We haven't taken to the corporate sponsorship all that well. Pritzker Pavillion is about the only thing I hear referred to by sponsor name. We have chipped away at our old institutions in the new age of naming rights and sponsors. US Cellular Field and the United Center are the notable ones. Their old venues were Comiskey Park and Chicago Stadium respectively. Hehe, interesting. I just echoed what was etched in stone in front of it. :) I also knew it wasn't really called the bean, but I could not remember what it officially was. There were others around, but not on that side at that moment. It is March after all and still chilly out. It was also mid-afternoon.